One of the new features in SQL 2017 is a way to save Graph Data. First time I heard the term “graph” I was stunned… Graph Data? First thing, I thought that came into my mind: “Why would you save charts (graphs)”. Nevertheless, that is not what Graph Data is. When we are speaking about Graph Data we are not speaking about tables anymore but nodes and edges. A node can be compared with an entity, like person, employee, company or department. In addition, an edge is what relates the entities to each other. Both of them can have attributes. Where do we use them? First of all nothing that can be achieved with Graph Data, cannot be done with regular Relational Data. However, they can make it easier to express certain kind of queries. Especially if your application has complex many-to-many relationships, since it is very easy to add new relationships. Nothing better than to learn from an example. Database creation is identically the same as any other DB. The first small thing that is different is the Node (or Entity) creation. It is created just like any other table, except that you need to add the ‘AS NODE’ part at the end. To create the Edges (or Relations) it’s as simple as creating an “empty” table and add ‘AS EDGE’ at the end. But in case you want to add an attribute to a relationship. For example a ‘Person’ likes a ‘Restaurant’ and you want to let them give a rating. Then you can have ‘rating’ as a attribute of the ‘likes’ relations. What about data insertion? Nothing-special at least for Nodes. Although we only created a table for Likes with one column, we are inserting 3 values. So in this insertion we are saying that Person with id = 1 ‘Likes’ Restaurant with id = 1, and gives a rating of 9. In our table selection we choose all the tables we need, and then we use the MATCH syntax (new for Graphy Data). This is used to tell what kind of relationships you want to use. In a standard relational database this would always be the same. You would have a specific table where you keep track of which Person likes which Restaurant. 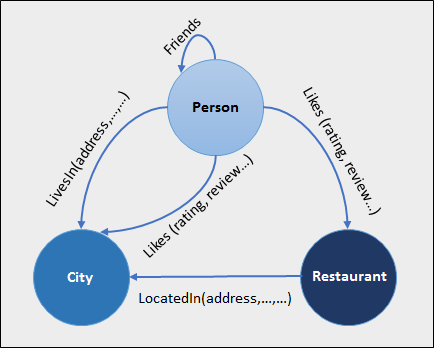 But with a Graph Database we can also keep track of which Person likes which Person. Some more advanced queries to show the power of graph data. This example should have given you a small overview of what Graphy Data is and what the possibilities are. If you want to learn more about the architecture behind it, then visit Microsoft Docs.